Climate change remains intractable globally, but Massachusetts is well positioned to be both a leader for policy and resilience. In this article, we’ll cover brass-tacks climate change for existing and prospective real estate owners and managers. We’ll focus on what would affect anyone alive today or born soon. We’ll assume for the sake of argument that the world continues to correct the situation despite speed bumps; if not, all bets are off. In Massachusetts, we are positioned to be both a leader in climate policy and resilient to climate-related changes. According to a recent WBUR poll, 88% of MA voters believe climate change is happening (margin of error 4.4 points). WBUR implies that we are not prioritizing a response in MA. This is consistent with our own policy priorities survey, in which our real estate owners and managers rank climate far below other industry-specific challenges. Despite this, much has been started to address climate change in Massachusetts, and more is being done every day. The economics of climate change have been understood since 1833, when William Foster Lloyd described a scenario he called “the tragedy of the commons.” This was named for areas like Boston Common, which used to be shared sheep grazing land. Lloyd’s scenario was as follows: If every owner let their sheep eat as much free grass as possible, every owner would be maximizing their personal wealth. (And there’s nothing wrong with that!) But if there aren’t rules to stop sheep from grazing in certain patches at certain times, or to limit the total number of sheep on the common, then all the grass will get eaten too quickly for it to regrow. The commons will become a parched wasteland, with no more food for any sheep. Of course, “tragedy of the commons” is exactly what we are doing with our atmosphere, and we are the sheep. Our gas heat, gas stoves, and combustion automobiles all maximize our wealth because they are cheaper than electric alternatives. But they all release carbon dioxide, a greenhouse gas that traps heat in the atmosphere. As long as carbon energy remains cheaper than zero-carbon energy, we will naturally continue to foul our common air and erode our Commonwealth. The NOAA Sea Level Tool was originally designed for lower forecasts, such that six feet would cover storm surge. The high forecasts for baseline rise now exceed six feet. Storm surge should be expected to be greater than shown. Image assumes global response to climate change matches Massachusetts’ response. According to a September 2011 report from the MA Executive Office of Environment and Government Affairs, global warming has caused our snow to melt earlier, and we have more days over 90 degrees than ever before. But the most significant change has been a confirmed increase in average sea levels: eight inches since record keeping began in 1921. By 2100, barring a technological miracle, sea levels in Massachusetts Bay will be at least one foot above present levels (94% certainty). The National Oceanic and Atmospheric Administration (NOAA) has a sea level tool that shows what various levels look like. In the tool, a sea level rise of six feet would submerge large sections of Cambridge and Boston, and much of the rest of the coast. Our interpretation of NOAA graphs indicates a 50% chance of more than ten additional inches of sea level rise by 2050. A 100-year storm surge is six feet (in New York), and as global temperatures rise, 100-year storms are expected to happen every 3 to 20 years. 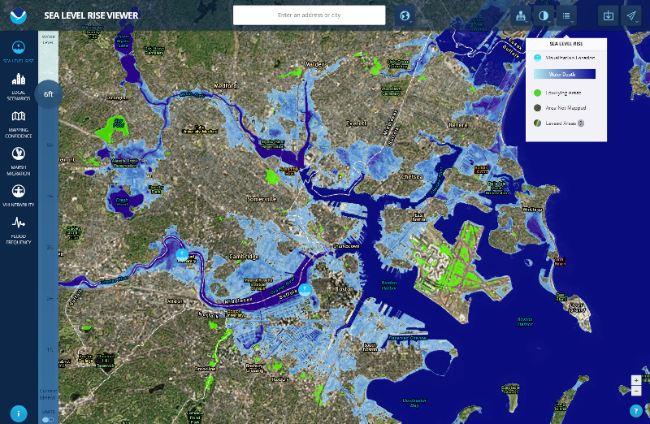 Combining the two statistics, one can conclude that major sections of Boston and Cambridge ought to be behind sea walls or levees (or conversely, that without such levees, owners should now purchase flood insurance). 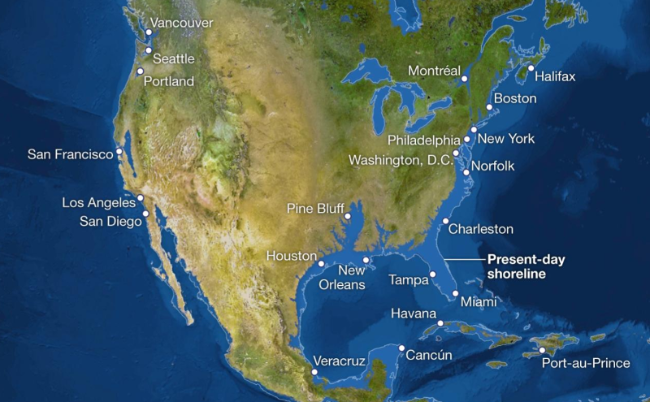 Some models predict, with less than 1% probability, that sea level change by 2100 will be as large as eight feet. Sea levels will continue to rise for centuries beyond 2100. 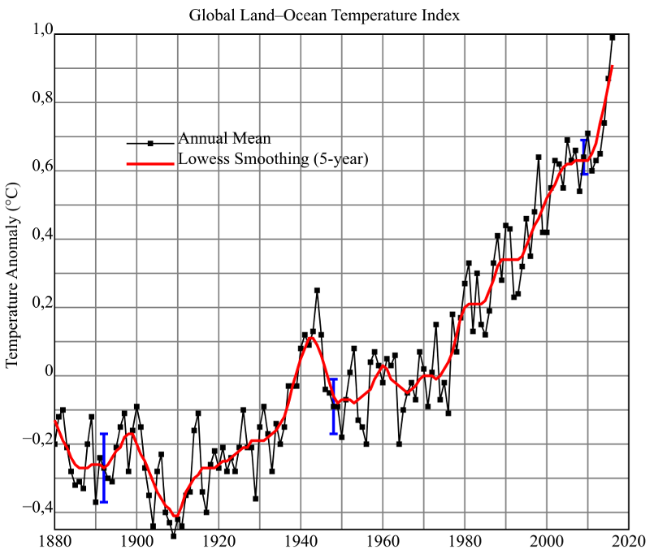 NOAA models already predict 30 feet past 2100, and newer models tend to show faster ice melt than previously imagined. The maximum theoretical rise is 230 feet, which if it were to happen would reshape the world. Under current models, the Commonwealth anticipates risk of submergence and storm damage to real estate and equipment totaling at least $465 billion (2011 dollars). Each major storm would require evacuation at a taxpayer expense of at least $2.0 to $6.5 billion per event. To our knowledge, it has not been decided whether coastal storm levees will be paid for out of state funds or municipal funds. A municipality with shaky economics may choose to initiate buy-backs and abandon the coastline, while others may invest in building and maintaining defenses. Flood insurance rates for properties are priced into property value, sometimes at multiples of the premium. According to CNN, a realtor in New Jersey saw $100,000 lost value for every $5,000 a year increase in flood insurance premiums. Flood insurance premiums have increased as the National Flood Insurance Program has redrawn its maps. Premiums should be expected to increase much faster than inflation and thereby decrease property values. It is possible that extensive underwriting losses following a major event may result in cancellation of the NFIP or private insurance, in which case the value of low-lying real estate would erode substantially. 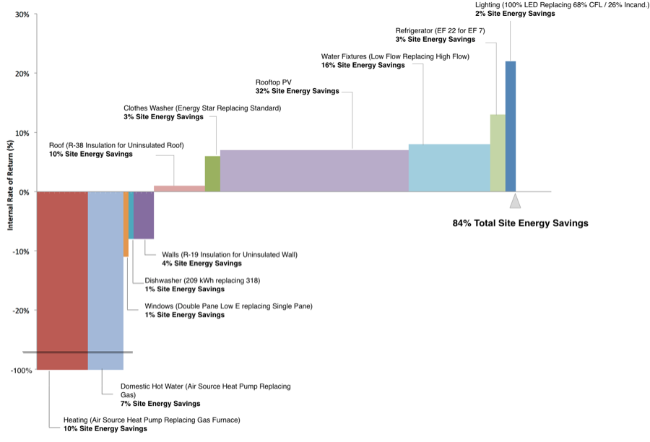 The Rocky Mountain Institute published an analysis of return on investment vs energy savings for a typical three-decker. LED lighting and EF 22 refrigerators had the highest payback. Replacing home heating systems were too costly, but would eliminate a lot of carbon emissions and would enable a higher rate of return for solar. The 2011 climate report, combined with anecdotal information (especially from owners in Springfield), imply that Boards of Health are being called out increasingly frequently to deal with heat stress and asthma, especially in lower income and elderly populations. Landlords should plan to upgrade electrical service to accommodate window air conditioners, and when renovating, should install electric heat pumps (ductless mini-splits) and full insulation. Not only will these measures keep the premises cool, but also these technologies will be greenhouse gas-free when supplied by nuclear, solar or wind electricity. The report indicates the number of 90-degree days in Massachusetts will increase ten-fold. The report also mentions a change in insect populations and disease frequency, making window screens and pest control more important. It is likely that the window screen regulation will be extended to cover more of the year or all of it (currently, screens are required only April 1 through October 30). Massachusetts’ USDA hardiness zone has changed from mostly Zone 5 (1990) to mostly Zone 6 (2006). It will continue to change, opening up options for landscaping, but also increasing the prevalence of certain weeds and the frequency of interior mold remediation. Winter freeze-thaw cycles may become more common, along with ice dams and resulting water damage. 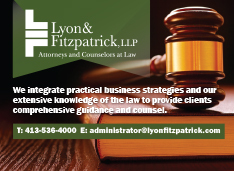 Companies whose stocks or ownership units are traded are already subject to SEC interpretative guidance requiring them to disclose how climate change is impacting their business. This will affect a small minority of MassLandlords member companies. 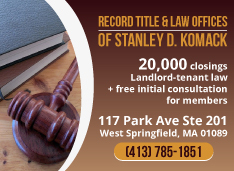 It is possible that MA regulations will require similar disclosures for sale of all real estate. An energy efficiency bill last session was an early warning (SD633: An Act relative to home energy efficiency, refiled in the current session as S 1839). As water availability changes, water usage will become more tightly regulated, both in terms of freshwater supply, septic tanks, and storm water runoff. Landlords can install dedicated irrigation meters that do not incur sewage charges, can change their landscape to include “xerophytic” (low-water) centerpiece plantings, and should budget for water submetering so that conservation restrictions can be leveled at renters directly. 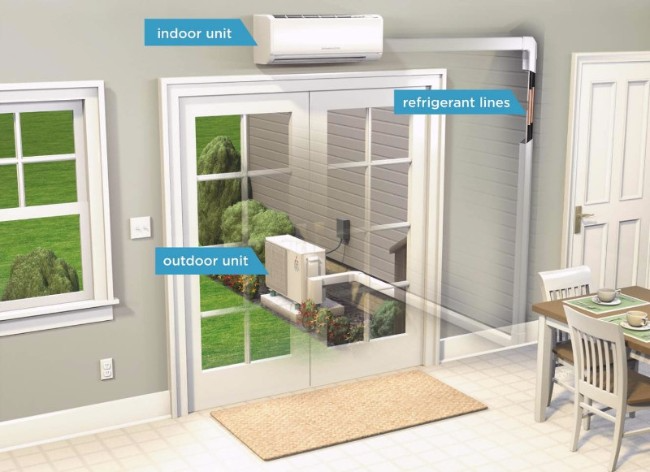 EnergyStar.gov diagrams the heating system of the future: ductless heat pumps can be retrofitted to existing housing, achieve very high efficiencies, and emit no carbon. In addition to the potentially large coastline changes indicated above, we can expect a number of social changes. Massachusetts’ progressive social services and high standard of living have made us a choice destination for those seeking shelter or refugee relocation. Our 2011 roll-out of HomeBASE briefly triggered cross-state migration. Gateway cities have been primary relocation centers for Vietnamese and Iraqi refugees. It is not certain how climate will negatively impact other parts of the world, but it stands to reason that Massachusetts will continue to be a relatively desirable location. Speculation ran rampant that the Syrian War and resulting exodus into Europe were the result of climate change, although The Guardian has critically debunked this. The critical food shortage in Yemen is likewise primarily the result of man’s inhumanity to man, but it is easy to imagine how arid regions might not recover from the sustained destruction of agriculture during these wars. If conflict and climate change combined do eventually lead to reduced regional capacity for water and food, we should expect to see increased demand on Massachusetts social services, and increased multiculturalism overall, due to migration. The MA Global Warming Solutions Act requires reductions of greenhouse gas emissions to 80% of 1990 levels by 2020. 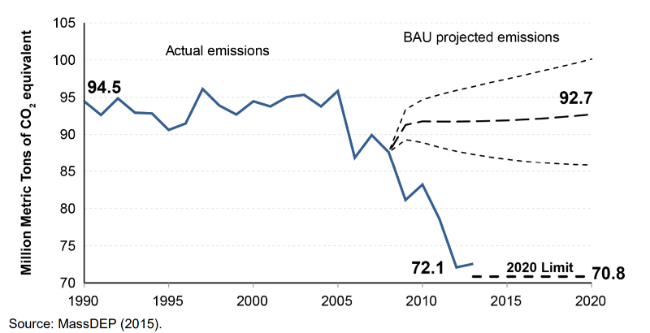 A reduction to 25% of 1990 levels is required by 2050. Our drive for energy efficiency has resulted in achieving the 2020 goal ahead of schedule. The 2050 goal will require major investments in electric vehicle infrastructure, mass transit, power generation, and residential heating and cooling. Massachusetts is already a leader. At 2% of the population we are 1.2% of greenhouse gas emissions nationwide. We have the technology and the density to go zero-carbon in a short time. Tax incentives can create economic incentives while we wait for mass production to make zero-carbon the cheaper alternative. MA DEP shows how our energy efficiency work has (at time of writing) achieved our 2020 emissions goal. “BAU” is the “business as usual” projection. Economists disagree on many things, but all agree that if you tax something, you get less of it. This is why one-fifth of the MA legislature and a growing number of MA residents support the idea of taxing greenhouse gas emissions. H 1726 An Act to Promote Green Infrastructure, Reduce Greenhouse Gas Emissions, and Create Jobs, and S 1821, An Act Combating Climate Change, suggest two alternate versions of carbon taxes. The Senate bill has 65 cosponsors, and the House Bill has 59 cosponsors. These numbers indicate strong support for a carbon tax. A typical household emits 18 tons of carbon dioxide gas a year. Under the proposals, an average household would eventually pay $60/mo for carbon, which would be refunded as long as they don’t use more carbon than average. If they use more than average, their refund won’t cover their tax. We proposed exactly this model for water pricing. If a carbon tax as outlined is passed, operators of residential real estate will start to see applicants include it in their selection criteria. They will inquire about carbon emissions. They will select apartments that have the lowest total cost of living, including carbon tax. In other words, they will select apartments that use electric heat pumps and solar instead of natural gas or oil. Right now, multi-family housing is characterized by loose exterior seams, lack of insulation, and cheaper windows. With insulation, double pane windows, and air-gap sealing, it would become economically beneficial to switch away from oil and gas heat and hot water. According to the Rocky Mountain Institute, these measures combined with electric heat pumps and rooftop solar would eliminate 64% of a typical three-decker’s energy consumption, and essentially all of its carbon emissions. 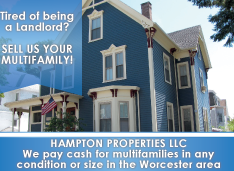 The first step for owners looking to retrofit is to contact Mass Save for an energy audit. Large amounts of tax money are available to individual owners for lighting and insulation. Overall, so long as the rest of the world also works to curb carbon emissions, the implications of climate change on Massachusetts real estate will be foreseeable and manageable. Coastal real estate will experience declining property values unless protected by levees, the funding for which has not been established. Owners and operators should expect to see increased regulation. A carbon tax seems likely, which will create a large free market incentive to eliminate carbon emissions. And real estate will continue to be the best way to ensure the prosperity of our families and future generations, so long as the world looks to Massachusetts leadership and follows suit.